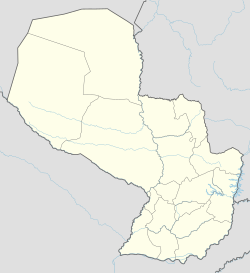 Encarnación (Spanish pronunciation: [eŋkaɾnaˈsjon]) is a district and the capital city of Itapúa Department in Paraguay, located at the south-east of the department, on the right-hand (western) shore of the Paraná River, opposite Posadas, Argentina. The city has an area of 274 km² and a population of 93,497 (2002 Census). Encarnación is the third-largest city of Paraguay. Encarnación is connected to the Argentine city of Posadas by the San Roque González de Santa Cruz Bridge and the International Train. The city is located on Route 1, some 370 km (225 miles) from Asunción, and located on Route 6, some 280 km (175 miles) from Ciudad del Este. The Teniente Amin Ayub Gonzalez Airport (IATA: ENO, ICAO: SGEN), at coordinates 27°13′23″S 55°50′03″W, is 12 kilometres from the city, is the third most important airport of the country. Encarnación is the capital of the department of Itapúa and has a total population of 93,497 and an urban population of 67,173 according to the 2002 National Census. Most of the inhabitants are of mixed Spanish and Amerindian descent as in the rest of Paraguay but there are also minorities of Germans, Ukrainians and Poles. The city is the largest settlement of Ukrainians in Paraguay. The mission called Anunciación de Itapua was founded by the Paraguayan Jesuit San Roque González de Santa Cruz on March 25, 1615 on the southern side of the Paraná river. That mission was relocated to the north side in the current location of the city in 1703 under the name Encarncación de Itapua. It gained in importance after the coming of the railway in 1894. In 1957, the city was made the seat of the Roman Catholic Diocese of Encarnación. Because of its mild climate Encarnación is often called "The Pearl of the South". Encarnación was the birthplace of Alfredo Stroessner, general and head of state of Paraguay from 1954 to 1989. Lately, the city experienced a radical change, with the loss of the "Zona Baja" because the "Plan de Terminación Yacyretá" (Termination plan of Yacyretá) giving way to a renewed modern city with wide avenues, bridges, etc. . Lately Encarnación has become the tourism capital of the country, with its wide beaches and newly completed waterfront boardwalk. The city is located near the Jesús and Trinidad Jesuit Ruins, declared World Heritage Sites by UNESCO in 1993. In 2015 Encarnacion reached a new peak in tourists that visited the city. With more than 30 000 people going there for their vacation Jaime Fernandez, head of the Hotel Association of Encarnación, confirmed that there were no places available throughout the Encarnacion and lodgings were improvised 50 km (31 miles) around the city. On December 2011 the Costanera Avenue was inaugurated and with it three beaches were opened to the public. These three beaches were the Mbói Ka’e Beach, the Pacu Cuá Beach, and the San José Beach. From the three beaches the San José Beach is the most visited by tourists and has several restaurants at the tourists disposal. Furthermore, another very big touristic attraction is the annually celebrated Carnaval Encarnaceno, usually in February. This event attracts more than 100,000 people every year and marks the summer high season in tourism for the city. Different clubs will compete against each other on a parade in which they will be qualified by a group of judges under the following criteria: originality, design, charisma, dance, rhythm, beauty, and elegance. Encarnación has a humid subtropical climate (Köppen Cfa). The summers are very hot and humid, and winters are temperate and cool. Due to its geographical position in the extreme south of the country Encarnación is the coldest city in Paraguay. Encarnación registered snowfall in the winter of 1975, the first time in the history of Paraguay. The annual mean temperature is 21 °C (70 °F). The annual mean relative humidity is 77%. ^ Atlas Censal del Paraguay - Itapúa, 2002. ^ Gonzalez Torres, Dionisio (2010). Origen y Historia de lo pueblos del Paraguay. Asuncion, Paraguay: Servilibro. ^ "Encarnación Climate Normals 1961–1990". National Oceanic and Atmospheric Administration. Retrieved March 9, 2015. ^ "Klimatafel von Encarnación / Rio Paraná, Dep. Itapuá / Paraguay" (PDF). Baseline climate means (1961-1990) from stations all over the world (in German). Deutscher Wetterdienst. Retrieved February 14, 2016. Wikivoyage has a travel guide for Encarnación. This page was last edited on 5 December 2018, at 12:40 (UTC).